After developing wide range of Java applications including Web and Desktop based since about four and half years now I have started learning Android Since last one month and day by day I'm getting very keen in learning the Same. Following is the Sample Android Login Application which I have developed and would like to share with everyone. This Application is at its very basic stage, Irrespective of the database used. If User Name and Password Entered are similar it gives a Toast pop up saying that "Login Successful"
Else It will give a Toast pop up Saying that "Invalid Login"
Following are the Screenshots of the Applications, Depending on their behaviours i.e. "Login Success" and "Invalid Login". I hope this example proves to be useful to the people learning Android. I will keep on updating with more and more examples. can you please show how to start the sub_activity from the same activity by using intents???? Its a Mind blowing work for android developers. mayuri mam is my guru. Thanks I am finding this type of login form ..
With use of database how datafetch?? I would like to thank for creating this interesting blog, because its having the good knowledge about android. so its useful to me. please how can i connect to my mysql database from this form ??? 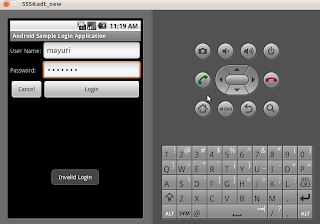 how to login my mail address from my android application??? can u create web app for login using servlets & jsp & import it into ur android project ??? Thanks for your post mayuri... This example was quite helpful. 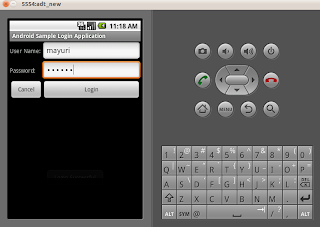 I have also referred this site http://androidtechstuffs.blogspot.in/2013/01/login-application-for-android.html, which looks quite useful. Have a look!! I have used the Intent but it is showing me error.. Will u plz. help me.? Good One yaar , Thank'z for Your Code. There should be a reset button on registration page. And after login directed to a new welcome page. Please provide me this code as soon as possible. 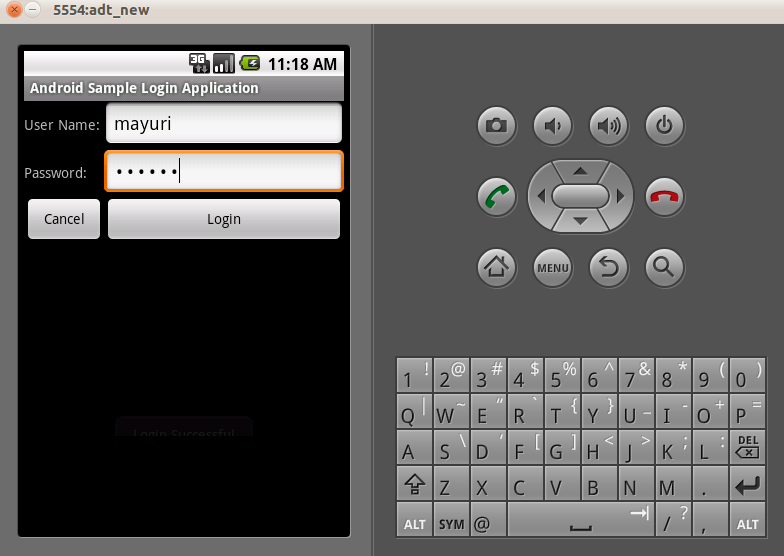 Can any body Explain how to authenticate login from remote server through PHP and MysQl.. I have tried several Tutorial nut unable to resolve the issue . My emulator gets stuck when ever i make any request to the server (Xaampp). I tried this app and most of it works. I copied the code snippets from here to a fullscreen app. My username field overlaps the app name field on the top left? Hi, may I know the connectivity coding for the same example shown above? please tell me how to handle the error "unfortunately has stopped "
Thanks Akhtar! I used to login in a sqlserver, impressive code! !